There have been one or two developments on the Modern Family story I posted yesterday, along with some questions and issues raised by people who commented on a version of that story that was syndicated over here. First and foremost, the cast went back to doing their jobs yesterday and production seemingly will not be further delayed. 20th Century Fox and the cast are still talking, but the lawsuit remains. As to comments on the other site, here are some of those issues in no particular order. 1. 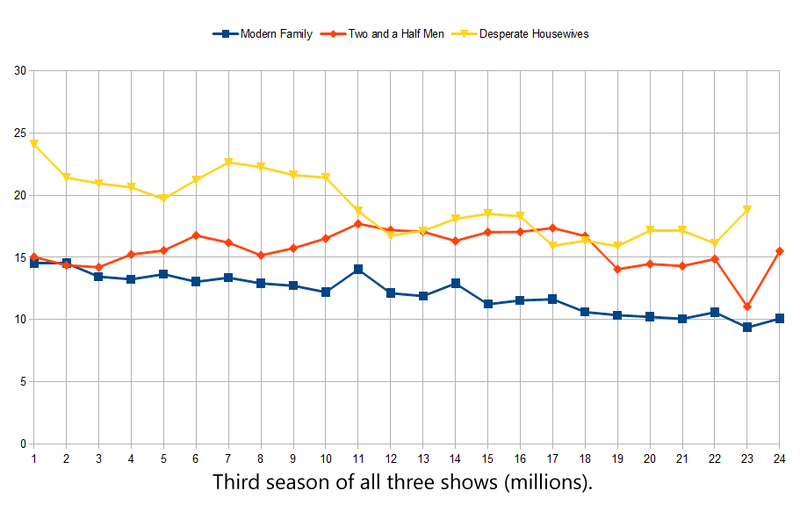 Modern Family is enormously profitable. That actually remains to be seen. It's public knowledge that ABC made $164 million in advertising revenue from the show last year. But ABC doesn't produce the show, they just license it from 20th Century Fox. 20th foots the bill to produce the show, which means the real issue is how profitable the show is for them, not ABC. It's my understanding that almost all shows are produced at a loss by the studio, which tries to make up for that and hopefully achieve a profit through syndication to cable and international markets, and DVD sales. There is no publicly available information on the license fee that ABC pays 20th, but it's certainly north of the $1.5 million per episode that USA just agreed to pay for their syndication deal. With that in mind, consider that 20th just offered the MF cast -- and were turned down in favor of this lawsuit -- salaries costing the studio at least $1.2 million per episode. 2. But actors and actresses on other big sitcoms, dramas, and reality shows are making between $400k and $500k per episode. True, but most of those shows have been on for more than seven seasons, and are still pulling in more viewers than Modern Family. CSI has been on the air for 12 seasons and still has ratings in the same ballpark as MF does heading into its fourth. CSI can do that because it began its life in the 20-30 million viewer range, while MF never topped 13 million in its first or second season, and fell from 14.5 million for the third season premier to 9.3 million in the second-to-last episode. If MF lasts as long as CSI has, it'd probably be in the 2-4 million viewer range by the 12th season, if that. People on shows like CSI earned that kind of money by having monster ratings out of the gate which allowed them to lose more than half their audience over the years, and still have good numbers. MF doesn't have that luxury and the cast of that show hasn't earned CSI-level money yet. Moreover, some people are simply overpaid. Charlie Sheen was pulling in $1.2 million per episode for Two and a Half Men, but the ratings haven't exactly imploded since he left. His replacement, Ashton Kutcher, is making over $800,000 per episode while retaining most of the audience. There are shows with significantly higher ratings and stars earning much less money than that. NCIS wrapped up its 9th season in May with a rock solid average (guesstimate) of 19 million viewers per episode, even though star Mark Hamon -- who has had a lot of success in the past decade -- was only making around $325,000 per episode in recent years. Harmon and Sheen can command big paychecks because they are proven stars. Nobody on the cast of Modern Family was an A-list star when the show debuted and were actually paid quite well by some standards. The non-A-list cast of The West Wing, a ratings hit and perennial Emmy magnet, were earning just $30,000 per episode on their initial contracts. Even Rob Lowe, who was an A-list talent, was earning just $70,000 per. Only Martin Sheen was making more than $100,000 per episode, yet the cast of MF, not a star amongst them, all rejected an offer from 20th of $200,000 per episode for a show with lower ratings and fewer Emmys than West Wing. 3. What about Tina Fey? She's making $350,000 per ep, yet 30 Rock has pitiful ratings compared to MF. Like The West Wing, 30 Rock has run up a record number of Emmy nominations and has won the Best Comedy award for four of its seven seasons on the air. But more than that, Tina Fey is A-list talent. She created the show, is the head writer (coming from SNL under Lorne Michaels, who produces 30 Rock), lead actress, and showrunner. It's actually surprising that Fey isn't earning more than that, and the reason is probably her desire to keep her show on the air as long as possible because this is what she loves to do. I wonder if the same could be said of the Modern Family cast. 4. 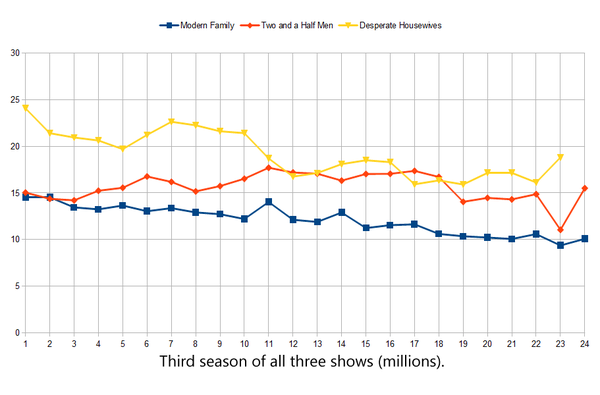 John Cryer Makes $550k per episode for 2 and 1/2 men, and the cast of desperate housewives got $400k per episode each. Cryer has been a central player on a very small cast for a sitcom that's been pulling in over 10 million viewers for nine straight years. 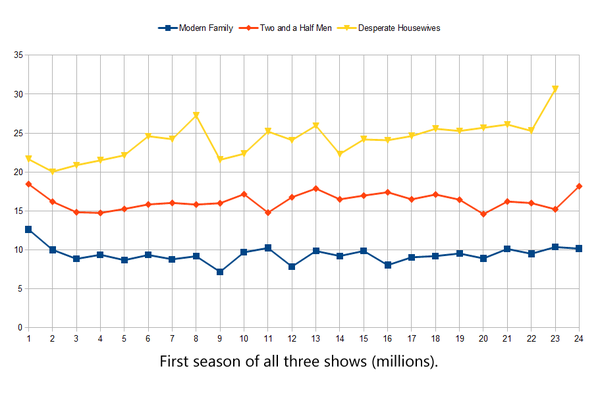 The 9th season of Two and a Half Men had a larger audience than MF in its 3rd. Again, these people are earning huge salaries because their shows have been winning their timeslot for almost a full decade. If and when MF does that, I doubt you'll find anyone saying they don't deserve that kind of money. It's the same story with Housewives, which has been pulling in 10+ million viewers for eight straight seasons, and began is life averaging nearly 20 million in its first season. 4. Do you see why the 20th Century proposed salary increases were in insult? No, I just don't see it. 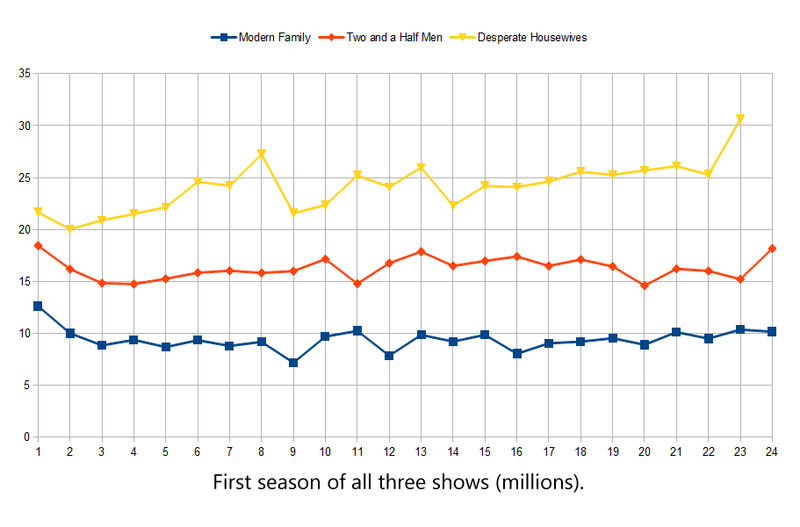 Modern Family has good ratings *now*, but all these other shows and their sky-high earning cast have had twice the ratings that MF had in their first few seasons, and are still doing the same numbers in years 7-12 as MF was struggling to do last year. Family began its 3rd season well, with 14.5 million viewers. But it steadily lost viewers nearly every single episode until hitting a season low of 9.3m in the second-to-last episode. Losing 35% of your audience from season premier to season finale is bad news no matter how you look at it. The simple fact is, the MF cast just turned down a raise that would have put them on par with a 5th-6th season show that has only aired three seasons worth, and just lost a pretty serious chunk of its own audience last year. That they even got that offer is amazing. That they turned it down and then sued the studio over it is inexplicable to me. There are too many unknown variables to analyze the situation much more than that. We know how much 20th offered the cast, but not what they are asking for. We know the lawsuit is frivolous. Beyond that, it's just speculation. Your analysis, as usual PW, is excellent and clear as crystal.